If you are looking for the "Perfect Smile" dental veneers might be the solution. If you have seriously discolored, chipped or misshapen teeth, dental veneers might be the solution. Veneers will help you by creating a very durable and pleasing smile. Veneers are also very difficult to stain. Dental Veneers are also used by people that are looking for the "perfect smile". Broken, Chipped or Discolored Teeth? 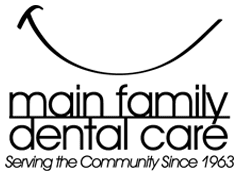 Your Davenport Dentists at Main Family Dental Care can provide you with the answer to your questions about dental veneers and the best solution if you have teeth that are chipped, broken or discolored. Interested in dental veneers? Contact the Davenport dentists.